Are you working on those basic addition and subtraction facts? My students use self-correcting puzzles to practice. One of their favorite things to do is each get a p uzzle and race to see who can get their puzzle put together first. It’s a great, easy way to practice facts quickly. You can grab a copy of any of my self correcting puzzles on Teachers Pay Teachers or on Raki’s Shop. They are $2.50 each and there are multiple versions to choose from! TOP SELLER! 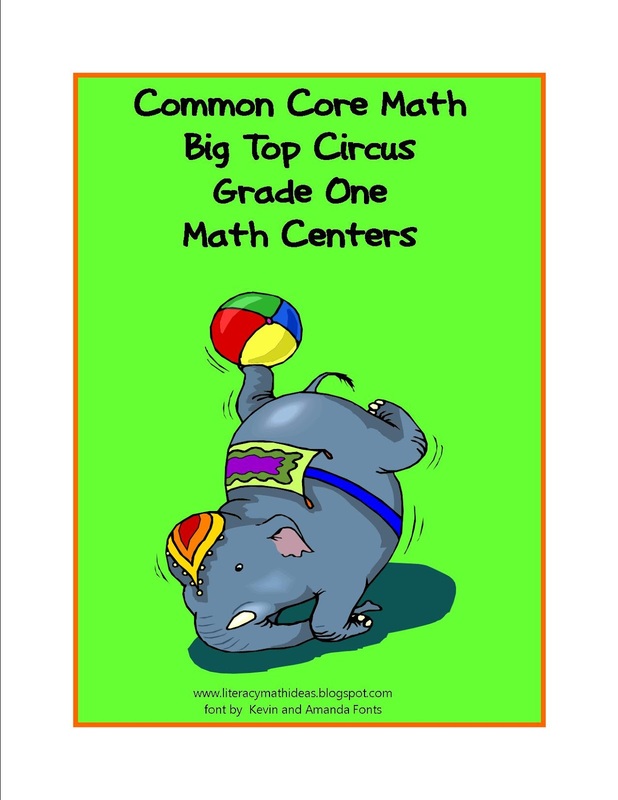 Common Core Math Big Top Circus Games: Grade 1 learning centers. If you are looking for Common Core resources for different grade levels, check out Common Core task cards at the bottom of this page. This collection of FIVE math learning centers is priced at $4.50. 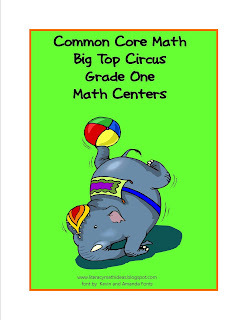 They are aligned to the Common Core Math Standards are make a great addition to any math center. I hope you caught my addition to the Picture Writing Prompt Linky Party and got 10 FREE writing prompts. If you would like seven FREE St. Patrick’s Day Picture Writing Prompts, sign up for the Raki’s Rad News Release. Dilemma Trigger Prompt Cards freebie! Some 'Dilemma Trigger prompt Cards' ... ever gave your class LOADS of input and they still write boring, generic and short stories? Well, hopefully giving them more focused direction using these cards may help your more able/ older children. I got the idea years ago from an old print out that a retired teacher gave me and have adapted it to suit my needs (and with the help of some lovely free borders courtesy of blogland). We plan to use them with mixed ability/age groups during our weekly visit to the woods. The children will be planning, acting out and then writing a fairytale with a twist... but you could just as easily use them in a classroom based story lesson. Next freebies will be for 'magic e' and for 'th and sh sounds'... coming soon! I can't think of a single student I've ever taught who didn't enjoy a card game in math class! 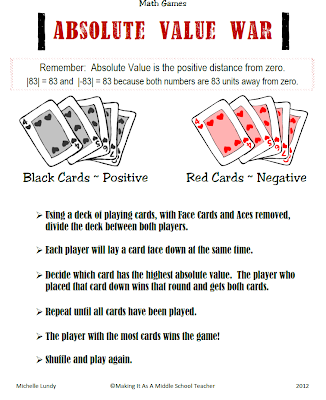 Hey guys, it's Michelle from Making It As A Middle School Teacher here with a fun, quick card game to reinforce Absolute Value skills. The instructions are super easy to follow so this would be a great addition to a math center rotation. 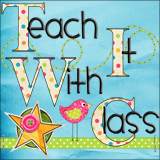 Click right on the image above to go straight to my Making It Teacher TPT Store to download yours now! One of my students’ favorite reading centers is called “reading puzzles”. In this center, my students use self correcting puzzles to match their word family words with a picture that depicts that word. Once they have matched all the words and pictures, they read all the words aloud. 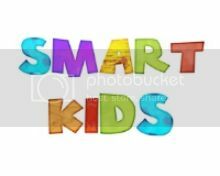 It’s a great way to build confidence with word family words, and to get kids to understand what all those rhyming words mean. 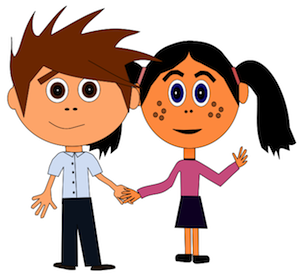 As with all of my word family products, the ACK Family is available free at Teachers Pay Teachers and at Raki’s Shop. 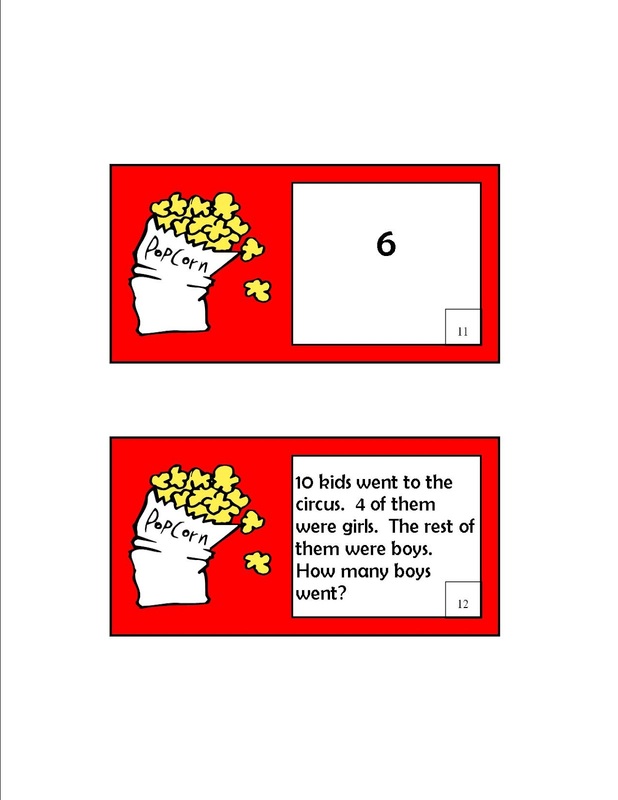 I have self correcting puzzles available for other word families for $2.50 per puzzle at Teachers Pay Teachers. I used Mel's (from Graphics from the Pond) cute clipart to make a short vowel word family center. Head on over to my blog to download your copy for free! 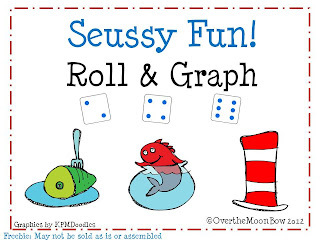 Your students will love this fun dice graphing activity with a Seuss theme! 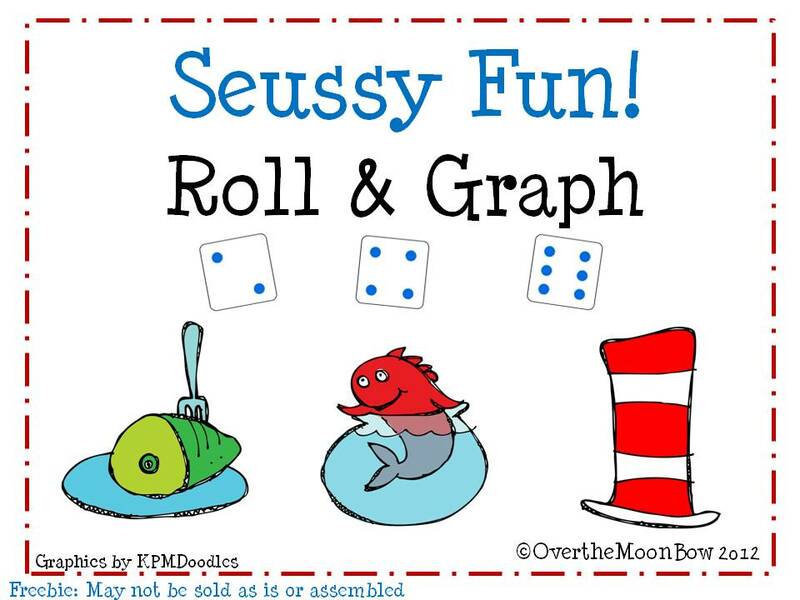 Visit my blog to download this fun freebie. While you're there, check out the Leap Year sale in my TpT & Teachers Notebook shops. All items are 20% off through February 29th. Are you working on Digraphs? Here is a new phonics sort to help your kids sort sounds by the digraphs: sh, ch, th and wh. 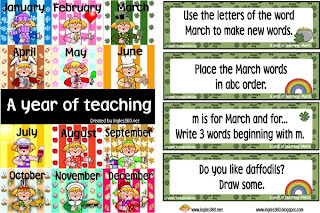 You can grab the Digraph Sort completely FREE on Teachers Pay Teachers. I made these task cards for my March centers. 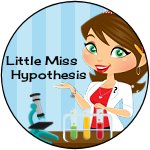 Rockin' Teacher Materials: New Math Mystery & a Leap Day SALE! 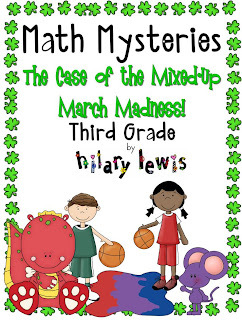 Rockin' Teacher Materials: New Math Mystery & a Leap Day SALE! : The newest Math Mystery is out . 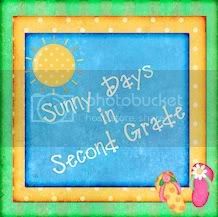 . . for 3rd grade . . . other grades coming soon! Don't forget the TpT sale on Leap Day! Get this mystery for 20% off + an Extra 10% from TpT with the code! So, I wasn’t sure exactly how to implement a Grammar Center with my First Graders, but I knew they needed it. I specifically wanted them to work on what a sentence should look like and what punctuation to put at the end. So, I played around and stumbled onto this Fix the Sentence idea. My kids love them! They are simple and just remind students to put a capitol at the beginning and a period at the end, while working on some very basic reading. Nothing fancy, but it’s really helping my kids, so I thought I would share! Here’s a link to the Google Docs form of this Center. 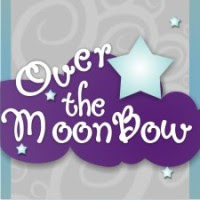 Grab a copy for FREE and hopefully your kids will love it as much as mine do! Did you catch my Valentine's Day and Presidents Day Main Idea Mix Up freebies? If you liked those, I've finally finished the literacy center set that can be used at any time of the year! There are 4 sets that feature penguins, cupcakes, monsters, and forest friends. 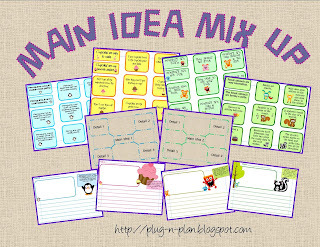 If this is your first time seeing this activity each set includes 2 main idea cards and 8 supporting detail cards. Students will use the 2 graphic organizer boards to sort the details to match the main ideas. Then students can use the themed writing paper to write either a narrative or informational piece using one of the completed graphic organizer boards. One of the great things about this is that this center can be differentiated by requiring students to either simply create a story using the information given for early learners or older students needing remediation. For higher learners needing a challenge you can simply request that students add research or text-to-self connections to their writing. Click the preview below to get your copy!